My sister Cassie and I visited Paris last Spring, and by the time we’d gotten from Charles de Gaulle to our hotel in Montmartre and thrown our bags in our room, we were starving. Â We struck out looking for someplace that would satisfy both me and my vegetarian sister, and found this little corner restaurant with arborite tables and a friendly atmosphere and some vegetarian options on the menu. The waiters were super-nice (as was almost everyone in Paris), complimenting my pathetic attempts at speaking French, and my meal of lentils with fennel and sausage completely floored me. Â I love lentils in just about every way they can be served, and something about the lentil-fennel combo strikes me a terrifically decadent. On the one hand, this dish is so cheap and easy to make, real comfort food, and on the other, it has this flavour and richness that makes me feel like I’m eatingÂ somethingÂ indulgent. Â And it’s quick, and taste good cold, so leftovers make an excellent lunch the next day. You can also, or course, make this recipe vegetarian/vegan, or serve it to a mixed crowd, by leaving out the sausages. Bring lentils, water, and 1/2 teaspoon salt to a boil in a 2-quart heavy saucepan, then reduce heat and simmer, uncovered, until lentils are just tender , approx. 25 minutes. While lentils simmer, cut fennel bulb into 1/4-inch dice and chop enough fennel fronds to measure 2 tablespoons. Heat 3 tablespoons oil in a 3- to 4-quart heavy saucepan over moderate heat until hot but not smoking, then stir in onion, carrot, fennel bulb, fennel seeds, and remaining teaspoon salt. Cover pan and cook, stirring occasionally, until vegetables are very tender, about 10 minutes. Meanwhile, lightly prick sausages in a couple of places with tip of a sharp knife, then cook sausages in remaining 1/2 tablespoon oil in a 10-inch nonstick skillet over moderately high heat, turning occasionally, until golden brown and cooked through, 12 to 15 minutes. Drain cooked lentils in a sieve set over a bowl and reserve cooking water. Stir lentils into vegetables with enough cooking water to moisten (1/4 to 1/2 cup) and cook over moderate heat until heated through. Stir in parsley, pepper, 1 tablespoon vinegar, and fennel fronds. Season with vinegar and salt. Cut sausages diagonally into 1/2-inch-thick slices. 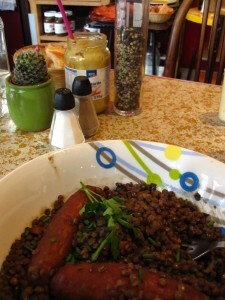 Serve lentils topped with sausage.